Our family is a big fan of pickles and we like both South Indian and North Indian varieties.We are very particular about the flavor and taste of pickles and ensure that we pair a north indian one with roti and a south indian variety with rice. I have various south Indian variety of Mango pickles like Andhra Avakay, Allam Avakay, Pesara Avakay, Bellam Avakay,Palli Avakay,Nuvvu Avakay, Magaya, Mukkala pacchadi, No Oil Mango Pickle , in my blog. These are prepared using Raw mangoes. 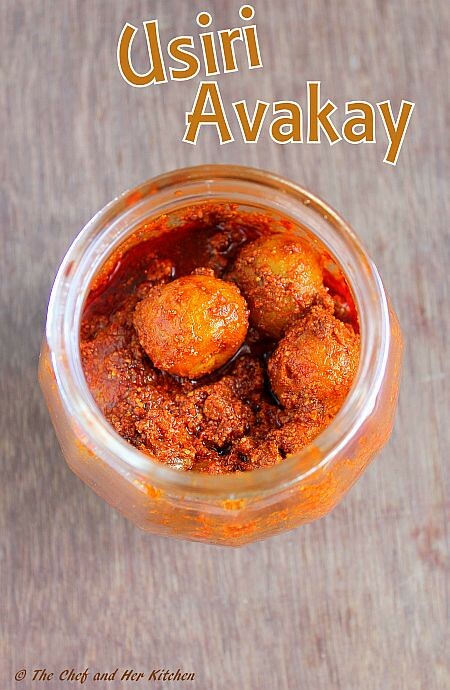 We absolutely love all the varieties and I do make a point to get these prepared by my MIL, but in limited quantities, so that we can enjoy the other kind of pickles which she prepares during winters.During winters, she prepares pickles with fresh vegetables, red chillies and gooseberries.I love Usiri avakaya (Andhra style Gooseberry pickle) more than the regular Avakay made up of mango as gooseberries lend a nice taste and flavor to the pickle.The process of making this gooseberry pickles is not complicated,hence you can make small batches and enjoy with your curd rice or you can even mix it with hot rice,dal podi and ghee.If it is prepared carefully, the shelf life is longer for this pickle,hence if you want you. can even make it in larger batches and store it. Wash and wipe the gooseberries and let them dry on a kitchen towel for 2-3 hrs. Heat sesame oil in a thick heavy bottomed kadai/pan and add dried amlas and fry them for a couple of minutes.Cover it with a deep lid and add pour some water(1/2 cup) on the lid,this process creates steam cooking but ensure that you take the lid always carefully so that water does not splutter on the amlas, otherwise the pickle will get spoilt. Reduce the flame and let the amlas cook on low flame for 12-15 mins until they are slightly soft.Stir once or twice in between by lifting the lid carefully.If the water evaporates in the lid add some water on to the plate.Some might even crackle which indicates that they are completely done. Remove the lid and let them cool completely. Meanwhile grind a tsp of fenugreek seeds to a fine powder in the mixer. 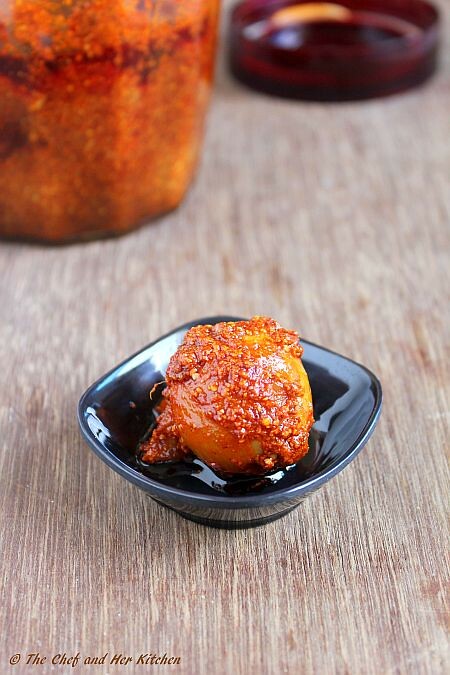 I used a less spicy variety of red chili powder for the pickle,if you are using more spicy one reduce the quantity of chili powder by 2-3 tbsp in the recipe. 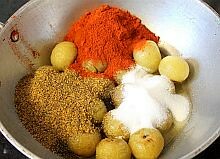 Add the fenugreek and mustard powder,turmeric powder,red chili powder,salt to the cooled amlas and mix nicely. Check the taste of the mixed mixture,it should be salty now.If it is less salty add another tbsp of salt. If the salt is less in the pickle,it will get spoilt soon. Carefully transfer this to a clean and sterilized glass bottle and cover it. After 3 days the oil should float on top of the pickle.If it does not float add heated and cooled sesame oil(1/3 cup) to the pickle and mix well. Let the pickle stand for a week before using so that the pickle get marinated and flavors blend nicely.You can store it outside but I suggest you to refrigerate the pickle. 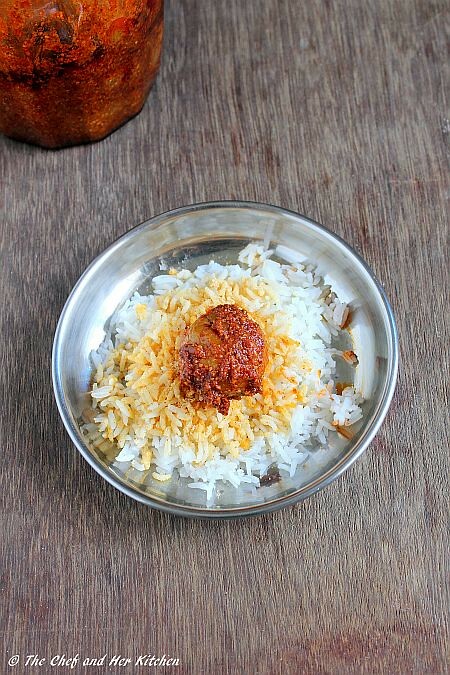 Serve it with Curd rice or you can even mix it with hot rice,dal powder and ghee. 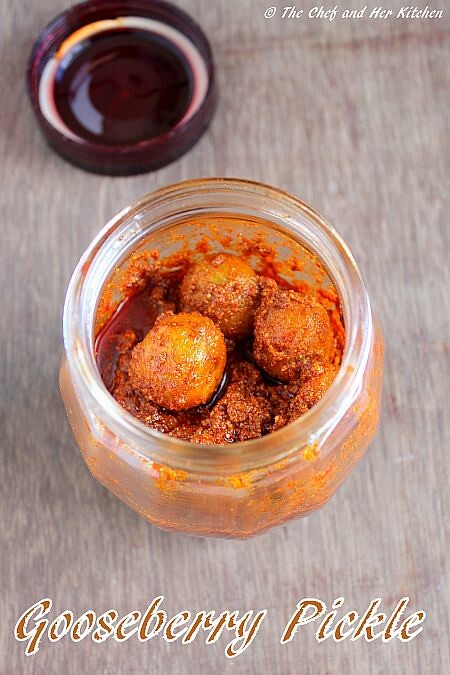 Use red chili powder which is specially used for pickles as this variety gives a nice and bright red color to the pickle and also it is not very spicy.My MIL brought a brand called 'Three Mangoes' which is good for pickles.It is not very spicy and also gives beautiful bright red color to pickle giving a fiery look.I used less spicy one,if you are using more spicy one reduce the quantity by 2-3 tbsp in the recipe. Increase the amount of sesame oil as required in the recipe.The basic thumb rule is to make the oil float over the pickle after 3 days.So feel free to add extra sesame oil. In general it is said if the pickle is prepared well it would stay good for long time like 5-6 months or upto an year.I am not sure about the shelf life for that long as I always make it in small quantities and finish it in 2-3 weeks time. You can avoid mustard powder in the recipe to make simple Amla pickle.Follow the same process and avoid mustard powder in the recipe. 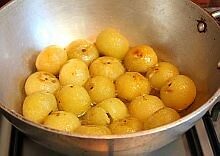 You can pressure cook gooseberries by placing them in a vessel with out adding any water to it for 1 whistle. My mom usually adds lemon juice at the end to the pickle.She says it enhances the taste of it and also the shelf life of the pickle.In this case you can add about 1/4 cup to the pickle. I also made an instant variety pickle with nellikai...love ur recipe..will try it soon..
Amla is healthy in any form, goodness of vit.c. Ur version is interesting,I usually make small pieces for the pickle. Please check my blog for tasty cup cake with cream cheese frosting. looks mouthwatering and lovely clicks.. I too prepared the amla pickle with almost same measurement as you mentioned except that I do not steam the amla instead, I only fry then in oil and without water. Your variation sounds intresting, shall try next time. 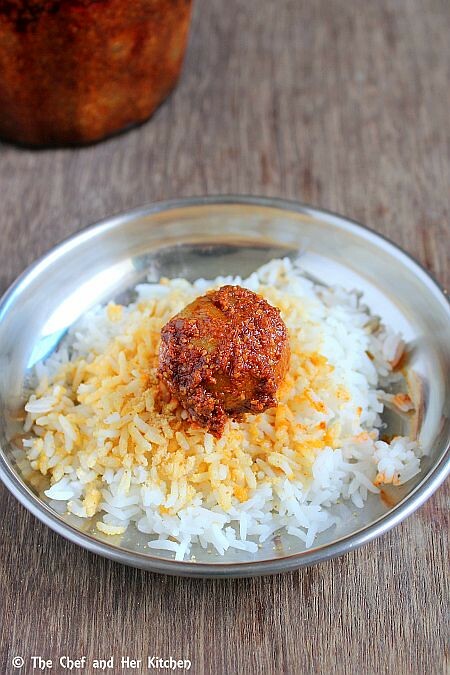 Pickle with rice looks so alluring..
@anonymous..you can use 1/4 cup initially,that should be enough ..the pickle would be salty after it is prepared immediately...after 3 days when the pickle gets marinated nicely,taste it and add extra 1 tbsp if you feel that the salt is less in the pickle. If the salt is less the pickle would get spoilt soon,so better taste it after 3 days and add extra if needed. I love gooseberries in general. I wish we can find some here in the U.S to make pickles. They look delicious. Very tempting & so very lip smacking..This version of pickle is very new to me too..Bookmarked!! Slurp,am missing this amlas already and you are killing me with this beautiful pickle. Super super superly made..fab clicks and loved ur black small plate..
Have not tried this way. Looks yummy and tempting. I too have a gooseberry post coming up. the pickle looks really yummy and mouth watering. this summer i plan to make amla pickle. Wow love this pickle its way better than mango.I love it with everything.I also make it the same way. @anonymous..use 1/3 cup mustard powder in the recipe,sorry for the confusion will update the recipe..kindly let me know how it turned out!!! Hi, can we use regular sunflower oil instead on sesame oil. Thanks Shweta. I too want to try it once, but I have one doubt that the mustard and fenugreek seeds needs to be dry fried, before making them powder? You dont need to remove the seeds of gooseberries..
Also you can use raw mustard seeds to powder it, no need to roast and its the same with methi seeds too.